WASHINGTON (CNS) — It all started in the wardroom at the U.S. Coast Guard Academy. One of the Catholic cadets stood up at lunch and announced that a group of students would pray the rosary every Monday. The announcement piqued Miguel Melendez’s interest. “I was like, ‘I want to do that, I want to meet these people and pray even though I hadn’t been in the habit of it growing up,'” Melendez told Catholic News Service. A few weeks later, he went to the rosary group. He started praying with them every week and then, in October, every day. The Catholic cadets were tightknit. On Wednesdays, they’d sit together at lunch and introduce their white-haired military chaplain, Father Steve Rock, to new music by Matt Maher. Melendez, who had grown up listening to Christian radio, fit right in. “He was always around, always interested,” Father Rock said. Melendez started reading the books his friends showed him by popular Catholic apologists like Peter Kreeft and Scott and Kimberly Hahn. Melendez became a leader in the Catholic group and asked Father Rock for advice from time to time. He went to Mexico on a mission trip, and when he came back, he told Father Rock that he wanted to drop out of the academy to become a priest. Father Rock convinced him to finish his degree and mandatory service first. “The vocation won’t go away at this time, and it won’t be harmful for me to go in the Coast Guard for a little while and continue to discern, maybe date a little as well,” Melendez recalled. Melendez finished college and became one of the youngest commanding officers on his Coast Guard cutter, the Kingfisher. A few years later, the Coast Guard offered him the chance to complete graduate studies and continue his service for a few more years. He called Father Rock, who knew would understand how promising the opportunity was. “You know, Miguel, if you don’t become a priest now, you never will,” Father Rock told him. Melendez attended seminary at Theological College in Washington and was ordained in the Diocese of Richmond, Virginia, June 3. 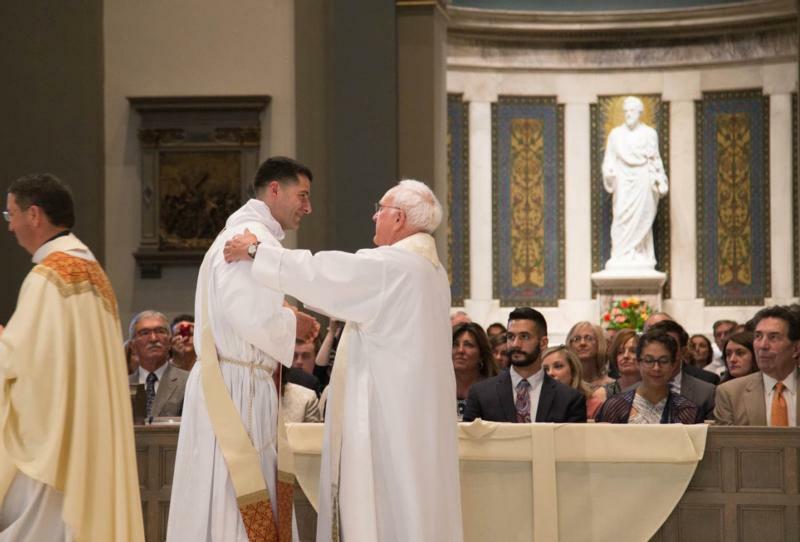 Like Father Melendez, about 5 percent of the men ordained to the priesthood this year had previously served in the armed forces, according to a report from the Center for Applied Research in the Apostolate. This statistic varies significantly from year to year. This year, 3 percent of the ordained men said a military chaplain encouraged them to consider the priesthood. Archbishop Timothy P. Broglio of the U.S. Archdiocese for the Military Services said chaplains like Father Rock are in a unique position to encourage vocations. “I think because there’s a prevalence of young people in the military who maybe haven’t made a career decision, it makes the harvest rather plentiful,” Archbishop Broglio told CNS. He pointed out that people who serve in the military have already made the choice to serve a greater good, to face the unknown and to work in a hierarchical structure, all of which he said priests and religious do. Catholic military chaplains encourage people considering vocations to religious life to attend the military archdiocese’s discernment retreats. The archbishop said 30 to 40 people attend the retreats each semester. Father Melendez attended three of these retreats when he was in the Coast Guard and continued discerning throughout his time in the seminary. All in all, his discernment took 14 years, and Father Rock, he said, helped him the whole way. “The entire time, he’s been there for me more than any other priest. Whenever I call, he immediately picks up the phone. I think it’s hard to find a friend like that,” Father Melendez said. At his ordination, Father Melendez chose Father Rock to help him put on his priestly vestments for the first time. “It was very meaningful to have him do that, to put on the ‘symbols of the office,’ as the rite calls it. I think it’s so neat that we’re able to do that,” Father Melendez said. Father Rock said he has helped a few servicemen and women discern their vocations, but Father Melendez is the only one who has been ordained. Father Melendez said he has considered becoming a military chaplain himself, if only for a few years. “It feels like I’m being called into diocesan ministry, and the military chaplains come out of diocesan ministry. I don’t think I’d make a career out of it, but I’d be open to, like, three to five years in reserve chaplaincy. But I want to make myself as available as I can to my bishop,” Father Melendez said. He said it struck him how the chaplains were always available to him in the Coast Guard. “I think that really spoke to me when I was discerning. I would like to make this available to others as well, whether or not it’s in the context of the military,” Father Melendez said. He and Father Rock continue to keep in contact.